Thread Check Inc. offers a complete line of Vermont Class ZZ plain pin gage libraries certified to ISO 9002 and traceable to NIST. Vermont class ZZ Black Guard ™ class ZZ plain pin gages are specially treated with black oxide coating which penetrates the pin gage .000040" ‐ .000060" deep and acts as a visible wear indicator. The Black Guard™ also prevents rust and corrosion which extends the useful life of the gage. Class ZZ Black Guard ™ plain pin gages are a must for anyone making frequent and varied measurements. 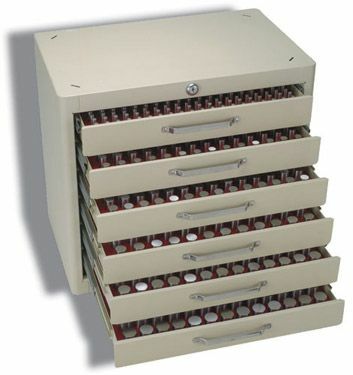 Class ZZ pin gage libraries are economically priced and readily available. Class ZZ plain pin gage libraries provide quick and accurate measurements of hole sizes. Class ZZ pin gages can be used to calculate distances between holes. These pin gages can be used to gage slot widths and check locations. They can be used to set snap gages and size in micrometers. Class ZZ pin gages are ideal to use for fixed limit go/no go gaging. Class ZZ pin gage libraries are offered in a wide range from .006" ‐ 1.0005" and in metric from .20mm to 25.49mm. They are available in plus and minus tolerances of .0002" or .005mm. All class ZZ pin gages are 2.0" in length and made of 52100 tool steel. They have a 10 micro inch surface finish and are round within .0001".All class ZZ pin gages over .060" are marked with size and direction of tolerance.